Eltronicschool. - This is one of the voltage monitor circuit schematic specific for battery that we called with circuit schematic of battery voltage monitor using LM709 integrated circuit look like in Figure 1 below. In this time, beside we will give you circuit schematic of battery voltage monitor using LM709, we also will give you global description and also component part. Circuit schematic like in Figure 1 above is Battery Voltage Monitor using LM709. According Electronicsproject site describe that the circuit of battery voltage monitor is fabricated and designed around op-amp IC LM709 configured as comparator. Where bi-color LED is used as indicator and indicates three voltage level state of a 12V battery. 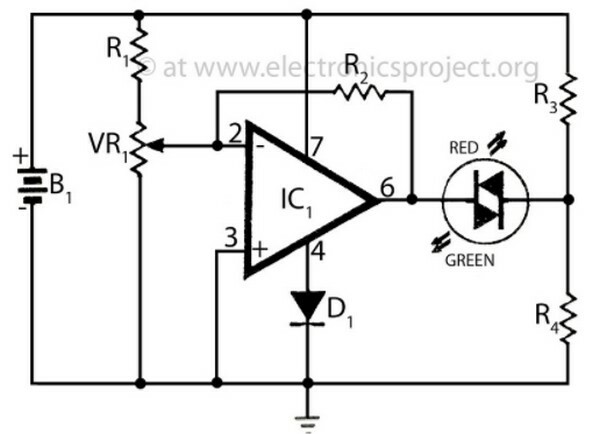 Resistor R1 with potentiometer VR1 is used as potential driver of voltage monitor circuit. When voltage level rise above 13.5 volts, the output from IC1 goes low as a result LED begins to emit RED light. Similarly, when the voltage fall below a preset level (10Volts) the output goes high and the LED start to emit GREEN light. Resistors R3 and R4 is used as current limiter of LED. Adjust VR1 such that LED begins to emit GREEN light when 10V DC is connected.